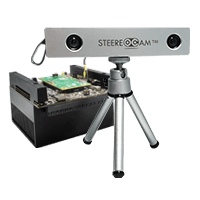 STEEReoCAM™ is a 2MP 3D MIPI Stereo camera for NVIDIA® Jetson AGX Xavier™/TX2 developer kit with improved accuracy and depth range. This MIPI Stereo camera is based on 1/2.9” OV2311 global shutter CMOS sensor from OmniVision. STEEReoCAM is bundled with the TaraXL SDK that runs on NVIDIA Jetson processors. Together they provide 3D depth maps for 1600 x 1300 resolution at 22 fps without stressing the CPU. e-con Systems also provides sample applications with source code, demonstrating synchronous stereo image streams, disparity map and depth measurement. Customers can build their depth sensing-based applications on top of this SDK with STEEReoCAM on NVIDIA Jetson platforms. The STEEReoCAM camera is ideal for applications such as robotics and autonomous guided vehicles, drones, surgical robotics, depth sensing, gesture recognition, 3D video recording, 3D measurements, embedded vision, and so on.